Paul Joseph Gaimard was the surgeon and naturalist on L'Uranie. He was born in Saint Zacherie, France in 1793, studied medicine and in 1816 joined the French navy. After this expedition he returned to Australia in 1826 in the Astrolabe under Dumont D'Urville. He never married, retired in 1848 and died in poverty in Paris in 1858. The first 60 pages of the journal were written by a clerk and contain Gaimard's record of instructions for the L'Uranie voyage, both general and those specific to his work as surgeon. 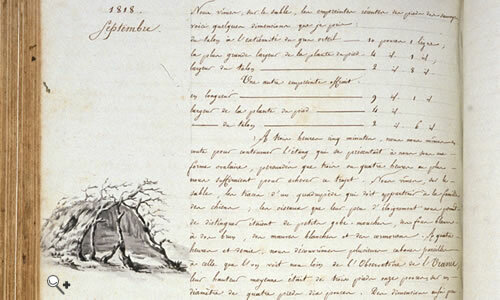 The remainder were written by Gaimard during the expedition with some marginal drawings by Jacques Arago, the expedition's official artist. Return to the Freycinet Collection.